If you want a free bookmark, email me at agkroger@gmail.com. So, here we are again. Sunday night. My early days of sobriety were really tough. I had quit my job. My family was disappointed in me. I was scared and alone. “I go home,” I said. And he replied, “Stay here. It’s safer.” Somehow in my heart, I knew he was right. I was safer inside the confines of AA. I was terrified of living alone and I was about to lose my apartment. One afternoon, at the 3:15 meeting, a beautiful fairy princess named Paula told me about a magical place where newly sober people could go to live. It was called a halfway house. I immediately moved in. About a month after that, a guy at the club said he needed someone to work for him at a little bakery. I immediately took the job. 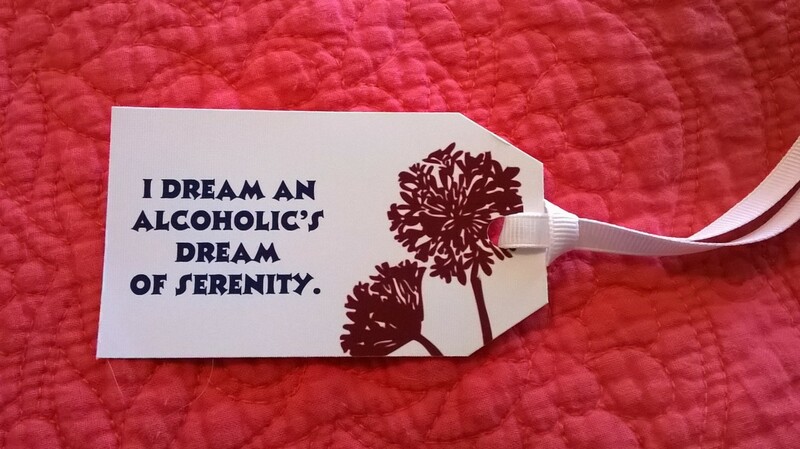 And that was more or less my first year of sobriety. Meetings, bakery, halfway house. AA is comprised up of “Twelve Steps” that one is supposed to do in order to connect to a higher power (or God). Additionally, the steps help one to get to the root causes of why one drinks and help us to clean up the mess we have all made of our lives. We also have a “Sponsor” that guides us through these steps. It took me a very long time to work the steps. I didn’t get a real sponsor. I asked a friend, a girl who I could manipulate, to be my sponsor. She didn’t know what she was doing, and I knew she didn’t know what she was doing. But I thought I knew what I was doing, so I did it. I was wrong. After some really poor behavior and acting out, I decided to get a real sponsor. And I worked through all the steps. I tell other people to not live by my example. Yes, I remained sober by the tippy tops of my fingernails, but it was not an enjoyable way to live. AA has a saying about being “Happy, joyous, and free.” I believe that is attainable for even the most anxiety ridden, fearful, angry, rotten, mischievous, stubborn, and depressed of us. But it takes a little bit of faith and a whole lot of working the steps. I think the question Normies ask the most is, “When do you get to stop going to meetings?” I love that normal people think nothing could possibly be more painful that sitting in a room of sober drunks while they complain about not being able to drink. Gosh, I agree, what a nightmare. The reality is, AA is a surprisingly funny and ridiculous place. Alcoholics tend to be shockingly intelligent. They have often lived interesting lives filled with amazing stories, both incredible and tragic. But what’s more, what I love about AA, is that at any given time, a roomful of people are saying, “Just for today, I am going to try to be a better person than the person I was yesterday.” Many days, we fail. But someday, well, it is nothing short of awesome. The city of Houston has roughly 2,000 AA meetings a week. Think about that for a second. It’s an astonishing number. 2,000. If every meeting had 10 people, that’s 20,000 people. 20,000 people who are trying to live a life of purpose. 20,000 people who are trying to help another 20,000 people get sober. 20,000 who believe that there are things and ideas that are of greater importance than any one of us. Why would I ever want to stop attending that? That’s the best part of my day. That’s the miracle part. Friday: Part Three. Why I speak so publicly. What Lydia would come to realize is that the reason why she could not remember any but the most dramatic days of that fateful summer, was that there were no last days, just one really long, Groundhog-esque day that kept repeating over and over again. Lydia had a vision of herself as a respectable woman. She was reasonably attractive, some may even say statuesque. She had a beautiful house, and a solid income. In many real ways, Lydia could have taken the opportunity of Henry’s departure and done anything. Their separation could have been a launching off point for Lydia. She had what very few people in life are blessed to have: the money to support her wildest dreams coupled with zero ties to hold her back. She had freedom and means. Lydia could have spent the sweltering summer in Argentina. She could have moved to France and studird cooking. She could have bought a second house in Napa Valley and spent her days painting the California country-side. And yet, Lydia was totally trapped within the prison of her mind. Lydia’s most striking memory from that time was the insane sunlight as it pooled through her cheery bedroom windows. She loathed the light, hated the idea that day was passing about her outside and she could do little more than drink in complete solitude. The laughter of the neighborhood children, dogs barking in delight, sent shivers of anger coursing through her body. If she could have built a deprivation chamber, or better yet, lived in one of those far-away places that is dark 18 hours of the day, Lydia would have been far happier. It is somehow worse, Lydia thought, when sad things happen on sunny days. Lydia sat by the pool, two ice cubes melting under the stare of the hot in her glass of bourbon. Any other day, any other time, one might have thought she was luxuriating under the elms in order to bring a rose hint to her cheeks. But today, unable to move, to move put one foot in front of the other, she was sitting. He just left. He came home, packed a bag and left. There was no fight, no hysteria. She wanted to muster the energy to throw something or cause a scene, but a scene for who? Why? To what end? He had left a long time ago, or so it seemed. All he did now was occupy a space in the closet. Its good he’s gone. Lydia thought for a moment about the kind of fear, stagnation that caused a person to stay, against all hopes of happiness, for just a little longer. Yes, there should have been an argument, Lydia determined. It would have looked better. It would have made a better story for the girls. Lydia imagined a handful of select women scattered around her den, sipping some sort of cocktail appropriate for the solemn occasion. Someone would pat her back as she sobbed and recounted the tearful accusations, the appeals to stay, the shattered Baccarat, and finally the pointed finger showing the way out. But instead, he just left. He came home, packed a bag and left. Left a note. She wouldn’t have even noticed he was gone had he not left the note. Lydia looked down at the bonded paper she had been holding this whole time. There was no need to read it again. It held no answers. Nor did it need to. Lydia knew the problems. Had known it for years. She originally said she was staying for the kids, but they had left a long time ago, off to lived their own lives in distant places. But then she still stayed. With a sigh, Lydia realized she stayed because she wanted to. No, it was true; the marriage was over a long time ago. But Lydia loved the house with the trees and the sparking pool. She loved her place amongst their society. And she loved her husband. As she put the rocks glass against her lips, she smiled. She loved the bourbon. What Lydia did not love was being the subject of speculation. It was hard to contemplate Christmas while the shone so brightly, but she knew it would be here faster than she could imagine. Lydia squinted off into the distance as if this small change in perspective would somehow give her foresight into the future. In her daydream, Lydia saw women leaning conspiratorially over the dinner table to their husbands, “But we can’t invite both of them. It’s too soon. Do you think she found out?” Lydia and her husband had this conversation themselves many times over. They feigned concern, but in the light of the summer afternoon, Lydia admitted to only the trees that it was really just a way to pass idle gossip off as something more than it was. They would invite her husband, of course, save a select few. Lydia looked down at the empty glass. She wanted more. But she usually wanted more. That was nothing new. Lydia hoisted herself up from the pool chair and walked towards the backdoor. That’s the odd thing about change, it seems to happen quickly, without warning. He just left. He came home, packed a bag and left. It felt like an instant, but in reality, it had taken years. One shirt in the bag this year, a pair of shoes the next, until twenty-five years later the bag was packed. Lydia paused as she looked at her reflection in the glass of the backdoor. She was still young. Weathered, perhaps, but still beautiful in certain lights. Lydia knew one day she would have to sell the house and leave the neighborhood that she knew she could not afford by herself. But she will find a new house. And new friends. She will find a new lover, feel new fingers press into her hips. A sly smile crossed her lips. She might even quit drinking. Lydia took the bottle in one hand, the glass in the other, and walked further into the recesses of her dark house. But none of that would happen today. All she had to do today was this. Lydia sat by the pool, two ice cubes melting under the stare of the hot sun in her glass of bourbon. Any other day, any other time, one might have thought she was luxuriating under the elms in order to bring a rose hint to her cheeks. But today, unable to move, to move put one foot in front of the other, she was just sitting. But instead, he just left. He came home, packed a bag and left. Left a note. She wouldn’t have even noticed he was gone had he not left the note. Lydia looked down at the bonded paper she had been holding this whole time. There was no need to read it again. It held no answers. Nor did it need to. Lydia knew the problems. Had known it for years. She originally said she was staying for the kids, but they had left a long time ago, off to live their own lives in distant places. But then she still stayed. With a sigh, Lydia realized she stayed because she wanted to. No, it was true; the marriage was over a long time ago. But Lydia loved the house. She loved her place amongst their society. She even loved the trees and the sparkling pool. And she loved the bourbon.